I highly recommend this book. I read the first couple chapters and thought, “This is a BOOK!” Her prose is so lovely, so well constructed. I have loved her other books, such as “Daughter of Fortune,” also set in San Francisco, but during the Gold Rush. Most of the story is laid in a retirement community in San Francisco, containing some of the last hippies. The main characters are a young woman from Romania who ends up working there as an assistant to the old people and then as a personal assistant to Alma Belasco, the ward of a wealthy Jewish family with a mansion at Seacliff. She also had to leave her family and native land of Poland during WWII. Her parents sent her to relatives in San Francisco and their older son to study in England. 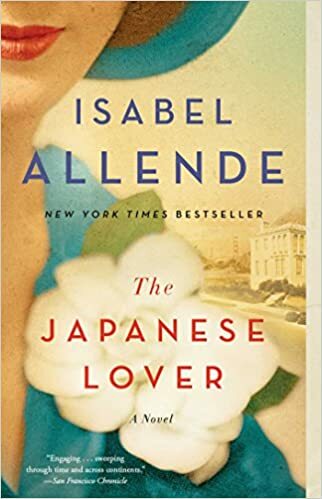 In her loneliness, Alma becomes close friends with the Belasco family’s youngest son Nathaniel and the son of the Japanese gardener at the estate. During the war Ichimei and his family sent to the internment camp at Topaz, in the desert. The book centers on the lifelong relationship between Alma and Ichimei in a time when biracial romances were hidden. We also see a relationship develop between Irina and Seth, Alma’s grandson, as they work on organizing mementos and memories from Alma’s life. This book is for adults, but would appeal to high school readers. There is no significant violence other than fisticuffs. Some sexual encounters, but delicately described. So delightful! It is a must read. This entry was posted in Adult Fiction, Uncategorized and tagged Berkelely, death, eldercare, family, family honor, gardening, internment, Japanese, Jewish, katana, loss of parents, love, Mystery, prison camp, retirement, romance, San Francisco, sexual exploitation, Topaz, World War II. Bookmark the permalink.